AC/DC turned to Brian Johnson in order to fill the void left by Bon. Brian’s searing vocals Iced Back in Black, one of the best-selling rock albums of all time! Podge Blacksmith, a double take for Brian, gives a vocal masterclass which is un-paralleled in his half of the show and brings it bang up to date with more classic tracks right up to AC/DC’s hugely successful recent album, Rock or Bust. The thundering freight train of a rhythm section keeps it all meticulously together with Dan as the metronomic Malcolm Young on rhythm guitar. Ed as the mercurial Cliff Williams on Bass Guitar. Paul behind the kit as Phil Rudd and Chris Slade rolled into one. The band aim to put you slap bang in the middle of the show with hit after hit, and you are expected to join in! "Live Wire continue to command and conquer. Take cover!!!!!!!!!! Live Wire’s commitment to fans is outstanding." "Close Your Eyes and your Listening to ACDC Live. I was blown away at the energy." "From start to finish it was sheer brilliance from all members of the band. Very rare to find a band in my opinion who are as good as the real thing." 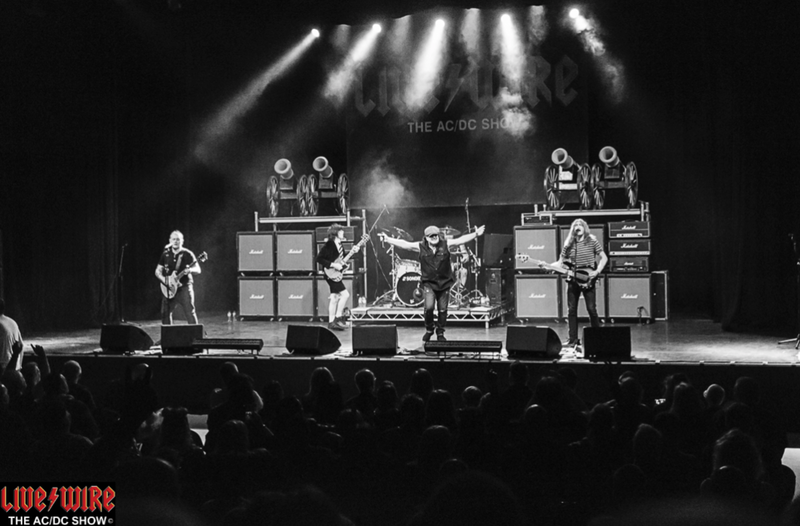 "Livewire (AC/DC) are one of the best & most entertaining tribute bands we have seen. Also had the best of both worlds as they covered Bon Scott & Brian Johnson." "If you haven’t seen these guys yet you don’t know what you’re missing! They are simply the best AC/DC tribute ever and a perfect recreation of the band in their heyday. An absolute MUST see!"